The 30 N high load head greatly expands the capability of the NanoTest Vantage to cover both the nano and micro ranges. Both loading mechanisms are permanently mounted side-by-side, allowing easy transfer of the sample between both. Materials commonly tested including cemented carbides, metals, shape memory alloys and hard coatings. These tests can be done at high temperature (max 500°C) or in inert environments. The optical microscope can be used for precise positioning of indentations. A knowledge of both hardness and toughness is required to assess performance under severe mechanical loading. Even subtle changes to the % binder and carbide grain size in cemented carbides can have a dramatic influence on tool life. It is the sub-surface mechanical properties that control the fatigue performance in applications such as high performance stamping. Micro-Indentation is used to determine the mechanical properties of different cemented carbides. 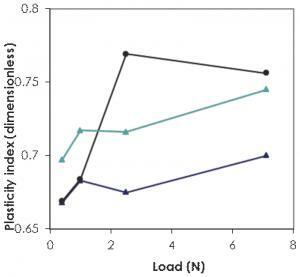 Figure 1 shows the variation in plasticity index with load for three commercial grades of WC-Co. Plasticity index = plastic work/total work. Even small changes can dramatically influence tool life. Figure 2 shows the high load stamping wear of WC-Co tools. There is a clear direct correlation between the Micro-Indentation data and the tool life. 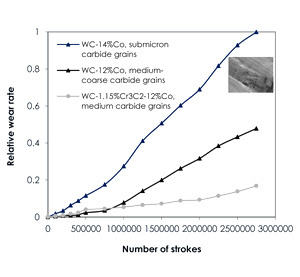 The WC-Co with the lowest plasticity index has greater tool wear due to brittle cracking. The high load head is also available as a standalone micro-hardness tester with our CORE Microindentation system.